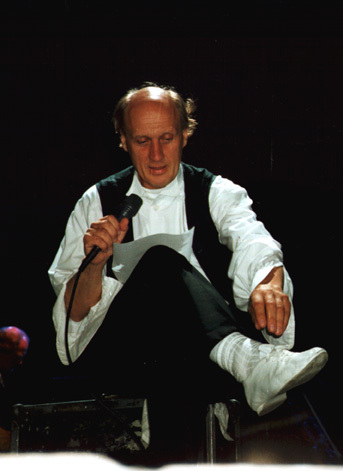 "Herman van Veen: All of him"
Dutch performer Herman van Veen is making a potent American debut on Broadway in the above-entitled show at the Ambassador Theater. Van Veen, in the au courant terminology, might be best described as a conceptual theater artist. It's a term that usually puts me off, promising an evening of pretentious erratic inspiration. But van Veen delivers an invigorating performance in a show that, down to every light cue, seems carefully structured to evoke surprise, sometimes astonishment, from his first entrance down the aisle throwing out handfuls of rice, to his final encore, when dressed in bathrobe, he pounds a drum and pits out a rock love song. The show moves from segment to segment with sometimes only the most tenuous connections but almost always with a strong theatricality, to unveil van Veen's muliple talents. In a melodiously resonant baritone, he sings a series of cabaret-style songs, many of which he collaborated on as composer or lyricist. Only rarely falling into common sentimentality, they are for the most part highly effective, and Christopher Adler's English adaptations communicate well. Musically, the work is compelling, the trio working with van Veen especially fine. Van Veen himself plays a richly timbrous violin. Combined with the music are a number of abstracted character bits, mixing lithe mime work with an expressionistic flair for stand-up comedy. All of it melds together in a theatrical rather than a variety format, and the mood is never wearing. There's an occasional air of social protest, more often metaphysical protest, but as a performer, van Veen lets his talents filter through a graceful, relaxed persona.